A recipe to master the art of sushi at home! 1. Prepare all ingredients on a chopping board. On clean, dry surface lay out nori sheets and fill a small cup with lukewarm water. 2. Combine vinegar, sugar and salt in a bowl, stirring to dissolve the sugar. Pour this mixture over the cooked quinoa and combine well. 3. 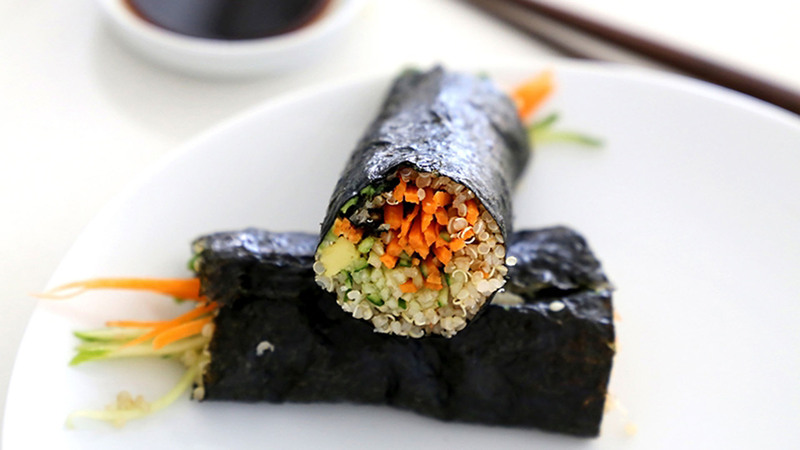 Take ½ cup of quinoa and spread evenly over a nori sheet. Lay out the fillings lengthways in a line. Roll sheet tightly until you get to 1 inch before the edge. Apply lukewarm water to the edge and finish rolling to seal. 4. Using a very sharp knife, slice rolls. Serve with tamari sauce to dip. Tip: We used avocado, cucumber and carrot to fill the sushi – you can create variations with other yummy ingredients such as mushrooms, eggplant and sweet potato.